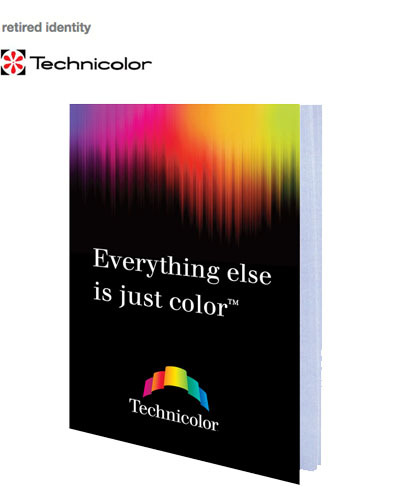 Technicolor’s enviable heritage traces back to 1915 when the company pioneered color film processing for the motion picture industry. Over time, however, competitors began offering faster and less expensive production services. As Technicolor expanded into video duplication in the 1980s and distribution in the 1990s, it became apparent that a revitalized brand was required to better communicate the breadth of Technicolor’s diverse, state-of-the-art services. Research revealed that while the company’s products and services had little awareness outside the film industry, the Technicolor brand name had continued to carry strong positive associations: Vibrant, high quality color and technical innovation. These qualities were not being communicated through the company’s visual identity, nor were the company’s diverse services. Emphasizing the significant equities in the Technicolor brand name, the new identity is inspired by the Aurora Borealis, the Northern Lights. The brilliant spectrum of color, suggesting Technicolor’s broad array of offerings, is rendered in the shape of a marquee, reinforcing the company’s motion picture heritage. The shape also suggests a film strip or videotape.